Okay guys, first, let me apologize for the horrible attempt to pun in my title. I tried my best, and that’s that. Let’s focus on the true subject of this piece, the recent trailer of M. Night Shyamalan’s Glass, the final piece to a franchise that he started all those years ago, a franchise that we didn’t even know existed until the movie Split in 2016. We all know how fond M. Night is of the plot twist, and the twist in Split is definitely one of the better ones, right up there with The Sixth Sense. I remember going out of my mind with excitement when I saw Bruce Willis in that diner, with my brothers not having any idea what was going on. I thought that moment could never be exceeded. Then I saw the trailer. Please watch it so you can understand what I mean and join me in my euphoria. Excuse me while I hyperventilate in a corner. Now that, is how you cut a trailer. Let’s go into the reasons why I can’t wait for January 2019. 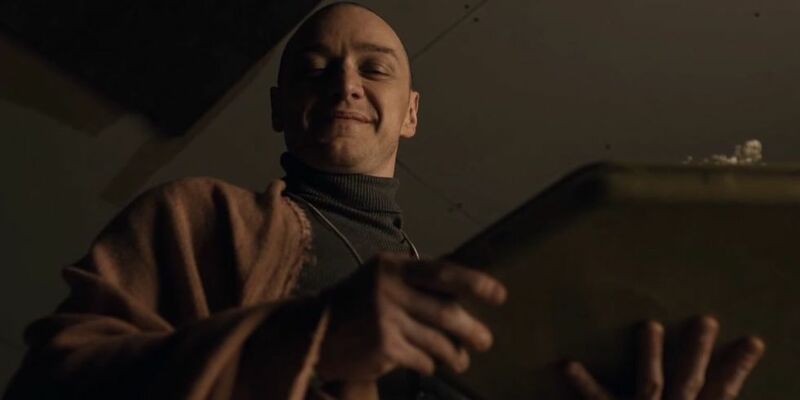 If you have watched Split, then you saw James McAvoy take on the extremely mammoth task of portraying a man with 23 different personalities, with the threat of a 24th personality looming dangerously. His tone of voice, his body language, his physique — he used every part of his body to make each personality distinct and recognizable. Not to mention, there is a moment that he had to play a personality who is pretending to be another personality, to be subtle yet obvious so that the audience would be clued in but also not entirely sure. This film needed an actor that would be able to do all that, because on the shoulders of someone less convincing, the movie would not have done as well as it did. Watching the trailer reminded me of how mesmerized I was by his performance the first time, and it appears he has taken it up a notch, with his beast persona looking more menacing than it was before. The best thing about watching Unbreakable is that it takes its time to establish that we are dealing with a superhero universe. David Dunn starts off as this really ordinary guy, the only survivor of a train accident, whom we see evolve into a man with extraordinary gifts. It is only at the end that we discover that Mr. Glass is the supervillain to his superhero, that all those lives lost in the various attacks Mr. Glass has instigated over the years was all done so that he could find him. Every hero needs a villain, and vice versa. The Joker establishes this very well in The Dark Knight. With the revelation that Split is a part of the universe, we now have the beast/the horde as another supervillain for our hero to contend with. There are some skeptics who say that the inclusion of Split in the universe was just a random thing M. Night decided on, in order to add more of a twist. I disagree. If Unbreakable is a superhero origin story, then Split is the origin story of a supervillain. Not to mention, Kevin lost his father in the train accident that David Dunn survived. Mr. Glass’ actions actually led to the creation of the beast, a creature who feasts on the pure and believes the broken are more evolved. The beast is facing off against a man who is literally unbreakable; they are each other’s opposites. So no, I think it is all very intentional, and kudos to M. Night for not using Unbreakable to market Split, so that the fans could have a more enjoyable movie experience at the end. Sarah Paulson is finally getting the recognition she deserves after years of being in the business. Her Emmy win for American Crime Story as well as her inclusion in Ocean’s 8 definitely cements her as one of the heavyweight actresses in Hollywood today. I am intrigued by her role in the movie. She plays a psychiatrist, providing therapy to our supervillains and superhero. She is obviously a skeptic, believing that these gifts they believe they have are really just delusions created by their minds. The addition of the commentary on mental illness is a good one I think. While McAvoy’s character doesn’t really bring good publicity for Disassociative Identity Disorder (DID), it does bring to light how thin the line is between possible and delusional. We have drawn very tight lines to define what we think is plausible, credible, real. We go to magic shows because we want to believe, but leave it questioning everything we saw, because it has to be a trick. I mean, magic can’t be real. If someone told you they could hear the voice of God, you would posit they have schizophrenia. I think movies like this stretch us to consider the way we think, the way we see others, as well as the way we see the world. I must say that Anya Taylor-Joy is riveting to watch on screen. A lot of her acting is centered on her face, her doe eyes conveying much of the emotional state of the character. Films that cast her seem to realize this about her as well, since we frequently get close up shots of her face that linger. This is especially so in The Witch and to a smaller extent, Morgan. While Morgan needed her to be more physically dominant, it was not those scenes that stood out for me, but rather, the portions where she holds conversations with other characters, navigating the line between A.I and human. She is definitely one of the more outstanding young actresses in Hollywood at the moment, so I can’t wait to see how she fits into the larger narrative of the movie, besides her obvious connection with Kevin. For the most part, M. Night’s films are very divisive, with the exception of The Sixth Sense, which is more or less lauded as one of his better films. Films like Unbreakable, Signs, The Village are enjoyed by some, loathed by others. But then, we got to the movies that people just outrightly disliked, films like The Last Airbender, Lady in the Water, The Happening. M. Night wasn’t capturing our attention anymore. Before, he could enthrall us with the mysterious, the supernatural, as well as produce a good script with actors who are able to deliver a compelling performance. After Split, all everyone could talk about, besides how good the movie is, is how happy they are that M. Night seems to moving back to the direction he started in. Glass could finally cement his return, with Split becoming the rule instead of the exception. Thank you for reading! What are you thoughts on Glass? How excited are you? Comment down below! Okay I’m excited. Can’t wait for this one! How about: 5 reasons you should raise your glass to glass? I did think about that, but I think raising your glass would indicate success, a kind of salute. The movie’s not out yet, so it remains to be seen whether it can deliver. Sameeee!! It really reminds me of why I liked M. Night so much in the first place. Glad to see his groove might be back. I am thinking of giving Signs a rewatch but at the same time I don’t wanna freak myself out. Haha…Signs was awesome, and a really great movie. Loved Mel Gibson in that one, and it was a really cool take on a genre that had little to no surprises left in it. Gigi at 60: Charming, Disturbing, or Both? Can ‘IT: Chapter 2’ Really Succeed As Good As The First? Mission: Impossible – What Exactly is Franchise Niche?